If you had to pick one player to smell blood in the water at an All-Star Game, Russell Westbrook would have been the obvious choice. If you had to pick one player to smell blood in the water at an All-Star Game, Westbrook would have been the obvious choice. With 41 points, one short of Wilt Chamberlain’s All-Star record, Westbrook took home MVP honors, led the West to a win and gave the Madison Square Garden crowd something to cheer about (sorry, Carmelo). Though we could have watched him go at it all night, he receives a slight demerit for taking 28 shots in an All-Star Game. Harden may not have gotten hot in Saturday’s Three-Point Contest, but he more than made up for it with 29 points, including seven threes, and showcased a well-rounded game with eight assists and eight rebounds. More often than not, it was Harden finding the net when the West needed a basket. Still skeptical on him being a self-proclaimed “great defender,” but in this environment, he gets a pass. Aldridge filled in effectively for injured Anthony Davis, and though he only grabbed two boards, he added 18 points and made all four of his shots from deep. With his unique skill set on display, the Blazers big man managed a significant offensive impact despite the game being predictably dominated by the guards. Boogie was his usual self, adding a respectable 14 points and 7 boards and earning Steve Kerr’s trust in the game’s final minutes. He’ll have plenty more All-Star games to improve on that mark. There might have been a slight hangover from Saturday night’s Three-Point Contest win for Curry, who shot just 3-of-10 from three and 6-for-16 overall. Several moments of brilliance, including a whirling flip-shot high off the glass and two spectacular feeds to James Harden for dunks, helped his case. Though the high point of the Gasol-Gasol matchup was the opening tip, Gasol led the West on the glass and stayed active. He’ll get some bragging rights at home. Dirk dunked! Though wasn’t especially effective, an alley-oop finish from Curry had his bench rolling, and everyone struggling to remember the last time he actually got above the rim. After he dusted off Vince Carter’s old throat-slash celebration, the highlight alone was more than enough. At least he made it into the game. Lillard never really got into the flow of things, adding a few threes but not a lot else. A bit of a point guard pecking order became evident with Paul and Westbrook controlling the ball most of the time in the halfcourt. A narrowly missed one-handed alley-oop almost helped his case. He only took two shots, and scored once. Duncan probably wouldn’t have minded a family vacation this week. It was a tough night for Thompson, who made just two of 11 field goals. After scoring 37 in one quarter in a real game, his bar was set pretty high Sunday. Durant played the fewest minutes on his team, and despite being banged up, the night was a disappointment. Maybe he just didn't want to have anything to talk about with the media. It didn’t take James long at all to get going, with three dunks in the first three minutes and 15 first-quarter points. All of which was a reminder that he’s still the league’s most dominant player when he wants to be, despite the lack of defense. Though he cooled the rest of the game, the pure entertainment value of the James' team-high 30 points and seven assists was exactly what everyone wanted from him. The game’s top marksman thrived with elite playmakers around him, to the tune of 21 points on seven threes in a fairly typical, yet no less impressive showing. The fact that there’s not much else to say here says a lot. Wall’s chemistry with James got the game off to a roaring start, and the Wizards star added some dunks of his own to showcase his freak athleticism in addition to his always-stellar playmaking. Though we missed him in the dunk contest Saturday night, there was plenty to enjoy here. 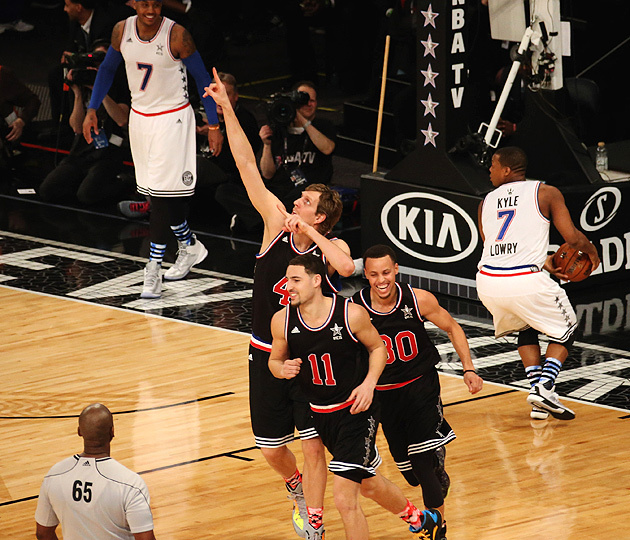 The first-time All-Star was typically steady, and validated his selection with 14 points in 13 minutes. Get in where you fit in. Another night, another double double for Gasol. Though the matchup with his brother was essentially a toss-up, it was that steadiness (and, probably, millions of votes from adoring Spanish fans) that got him here in the first place. Let’s face it, Bosh’s marquee event is the Shooting Stars competition. But 10 points in 10 minutes ain’t bad. Horford certainly deserved to be in this game and did his thing, adding eight points and seven rebounds. He proved his quiet, superb consistency plays in any environment (with an emphasis on quiet). Well, Lowry probably can’t wait for next year’s game in Toronto, where he could have a chance to redeem his 2-of-11 showing from beyond the arc. Eight assists helped a little bit. He’ll have Drake to answer to. The other elite point guards overshadowed Irving, who was solid but unassertive on his way to 11 points, six rebounds and five assists. Not to worry, he won All-Star MVP last year and has plenty more All-Star Games ahead of him. Yep, you had to scroll all the way to the bottom of the page to hear from Anthony. This might have been the banged-up Knicks star’s last game at Madison Square Garden for who-knows-how-long, and 6-of-20 from the field and 2-of-13 from behind the arc made for a rather unceremonious potential end to the current chapter of a strange, strange saga. As the game ended, news broke that the Knicks are buying out Amar'e Stoudemire. We know, Knicks fans, we know. Butler gets a bit of a pass for playing with an injured right shoulder. Odds are, he’ll get another crack at the whole All-Star thing before long. Not a whole lot to see here. Don’t worry, the Hawks are still in first place.